My sister in-law received two copies of this cookbook called, Cooking Light, for Christmas. Christmas feels like it was so long ago. My mom received the extra book from her. I’ve been looking through the book and oohing and aahing at the recipes and the photography. The book is not a Paleo book; it’s an ordinary cookbook that focuses on light cooking with an emphasis on portion control and weight loss. Anyways I really enjoyed the recipes. I made Kung Pao Chicken from it. The recipe was a hit with my family. I converted the recipe to a Paleo-like version. 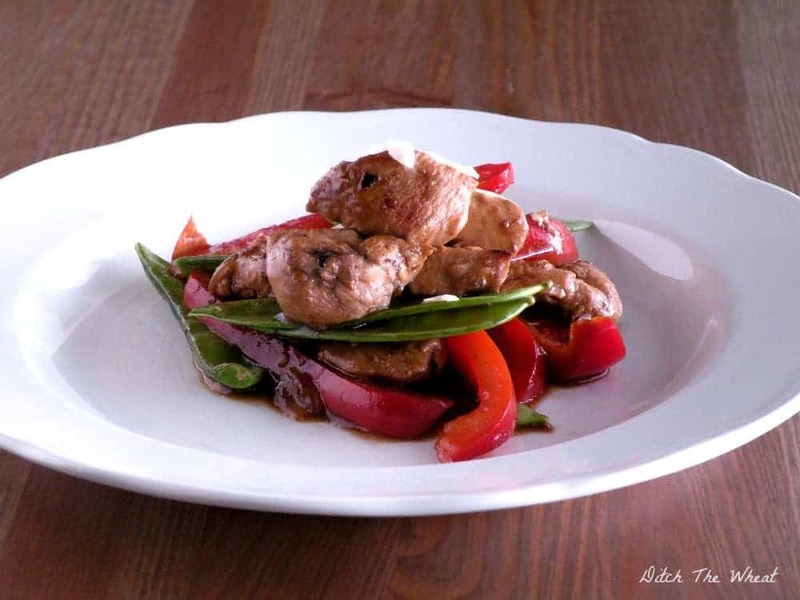 The Kung Pao Chicken recipe uses soy sauce like many Asian-inspired recipes. I am still trying to find the elusive coconut amino acids. I have searched health food store after health food store and I still cannot find coconut amino acids in Canada. I had to use gluten free soy sauce. (A note for newly converted gluten free people, traditional soy sauce is gluten free but the cheaper commercial version is not gluten free). The first time I made Paleo Kung Pao Chicken I deboned all of the chicken thigh meat. The second time I used deboned chicken breast. Deboned chicken thighs were not available at the grocery store. If you don’t have time or patience use chicken breast inside of chicken thighs. Yield: Serving 2. The cookbook says this recipe serves 4 but I found it was enough for 2 people. Heat a large skillet over medium-high heat. Add oil, sauté onions for 3 minutes. Add garlic, sauté for 30 seconds, and then add the chicken. Cook chicken until it begins to brown. Combine ¾ cup of cold water and the next 5 ingredients. Add the water mixture to pan; bring to a boil. Wait for it to thicken and continue stirring. Once it is thick add the bell peppers and snow peas. Cook for two minutes or until the vegetables are crispy/tender. Sprinkle the finished dish with sliced almonds. *Note if the sauce does not appear thick enough add more arrowroot. Take a little of the sauce out of the pan and mix with more arrowroot then add the mixture to the whole sauce and stir to mix. This recipe is adapted from, Kung Pao Chicken, Cooking Light, by Scott Mowbray and Ann Taylor Pittman, published by Oxmoor House 2012. Hi! I’m not sure how old this post is and where in Canada you are, but I live in Toronto and have seen coconut amino at the local health food store – Herbs and Nutrition.